We live busy lives, work our busy jobs, respond to our busy inbox, come home to our busy families. 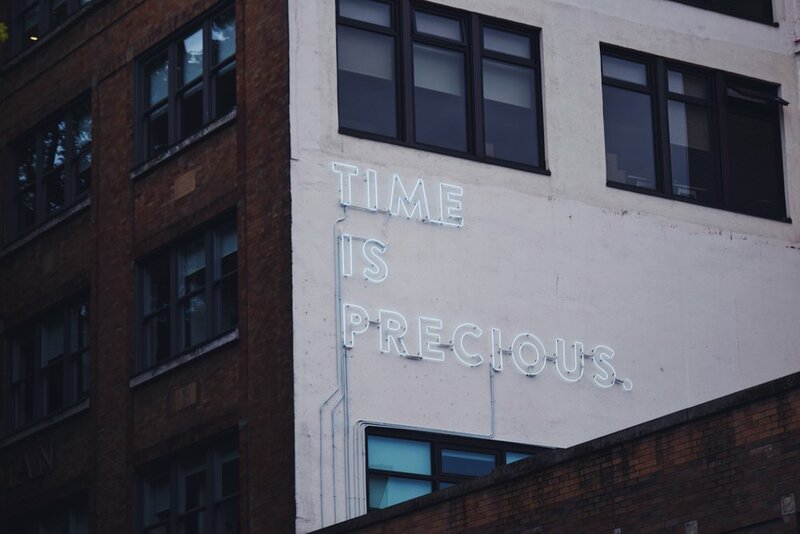 No matter what, time always seems to be a scarce commodity of which we never feel like there’s enough. Maybe you suffer from a common ailment that befalls most working adults — the curse of the unpredictable schedule. Let me share a secret. That’s right. Lean in a little closer. The truth is — time is a choice. Whether or not we are aware of this fact, we are — at every moment of every day —choosing how we spend our time, where we spend it, and with whom. Laura Vanderkam, writer, author of several time management books including Juliet’s School of Possibilities: A Little Story About the Power of Priorities, and gave an incredibly popular TED talk titled "How to gain control of your free time". She says we have to consciously make time in our lives for what’s important. So, how can we make decisions that supersede beyond the everyday noise and demands of others? Vanderkam unveils mismatches between how we think we spend our time and how we actually spend it. She offers her sage-like advice on in as little as 30 minutes. Teaching us how can we reclaim our life’s most precious commodity — time. The answer is shorter than you think! The glaring sound of the alarm shrieks across the stillness of his bedroom as Adam chaotically scrambles in search of his phone to shut it off. His vision comes into focus, the clock reads 5:45 a.m. “Ugh…just five more minutes” he says to himself after pressing the snooze button for the fifth time in a row. Somewhere around 6:37 a.m., he finally manages to roll out of bed and start the day. He missed his morning gym regiment, but shrugs it off and says, “oh well, there’s always tomorrow.” He remembers he didn’t lay out his clothes the night before on account of him staying up to binge watch The Good Place on Netflix. He shakes out an outfit from the laundry basket, takes a quick shower but forgets to brush his teeth, grabs his keys and heads for the door. No time for breakfast at home — he’ll eat whatever donut or bagel option is available in the break room. As he settles into his desk and opens his email, he has 346 unread emails in his inbox and looks at his calendar that shows three Skype meetings with clients, and two 45-minute conference calls with vendors. Adam’s boss walks by his desk, smirks at his unkempt appearance and asks him for a status update on the quarterly budget report. Adam searches vigorously through the stacks of paper piled on his desk to no avail. He knows this is now the third time he’s been asked to hand in a copy of the report. The boss gives him a disapproving look and warns him that if he doesn’t have a completed report on his desk by the end of the day, there will be a formal reprimand followed by disciplinary action. With anxiety coursing through his body, he despairs on how he will manage to complete this report, along with his other duties, on time. As we read and reflect on Adam’s story, setting aside any feelings of judgement (or sympathy) we may have regarding his lack of preparedness, his inability to set clear boundaries with others (clients, vendors, or his boss), or perhaps his overall mismanagement of time—the truth is, most of us have committed similar crimes in conjunction with our time. If we take a hard look at our lives and how we are managing our time — how often have we over committed ourselves for fear of disappointing others? How many nights have we chosen to binge on Netflix or Instagram, instead of attributing that time towards other things more important to us? How many times have we decided to lie in bed instead of getting up, going to the gym, meditating, and making a nutritious breakfast? Let he/she who committed no sin against the mismanagement of time cast the first stone. Most of us have felt the crippling anxiety of our lives unraveling before our eyes on account of either not knowing how to make choices on how we spend our time, or not knowing what our priorities are. Thus, time becomes a mutable force which tends to escape our grasp. Vanderkam reminds us that expectations are infinite, and time is finite. There will always exist a feeling that there’s something else you could (and sometimes should) be doing. There will always be more that somebody expects from you. Vanderkam says that there are as many expectations as there are stars. When you are choosing to do one thing, you’re choosing not to do something else. In either case, time is a choice. Let’s dispel a myth right now — We are always disappointing someone. It’s sad but it’s inevitable. And… that’s OK!! There are tradeoffs to everything we do. Every choice to do something is, by definition, a choice NOT to do something else. If disappointment is unavoidable – then we must ask ourselves who are we disappointing? Ourselves? Or someone else? Vanderkam says knowing this is liberating. We learn that we actually have more power than we think and can choose how we spend our time. When somebody asks for our time, we ultimately fill up our schedules with their requests — for one reason or another. We don’t always recognize this until it’s too late — the opportunity costs of relinquishing control of our time leads us to feeling overbooked and overcommitted. Instead of always saying yes to someone else, Vanderkam urges us to try this on for size — say yes to yourself. Envision Your Future — Who Are You Becoming? In order to see the full range of our choices laid before us, we must travel into the future. Are you living a happy life? Are you professionally fulfilled? Are you flourishing in your personal and professional life? If the answer is yes, what components, or activities, or relationships, or engagements makes your vision true? For instance, are you healthier because you see yourself following a regimented diet and exercise routine? Are you professionally fulfilled because you’ve advocated for yourself and took on more challenging yet creative projects? What vision did you create for yourself? Who did you become? Vanderkam says another exercise we want to do is picture someone giving you an award in ten years. If they recite a speech outlining the amazing things you’ve done — what actionable attributes would they list? What would they say about you? Next, envision that in order for you to receive this award, character references would need to be included. What would those closest to you say about you? What impact have you made on others or your community? What insight can you gather from this vision? Does your current life reflect where you’re headed? How can you make this vision you have for your life a reality? Like Spielberg’s notion on dreams, Vanderkam says the things we really want in life are not always the things that are screaming right in front of us. Our dreams can become muffled by the noise and if we aren’t careful, they can get lost in the busy-ness of our lives. Vanderkam says the only way to get around that is to schedule in our priorities. Unless we consciously choose to prioritize those things that matter to us, our time can swiftly be scheduled away and looped into someone else’s priorities. We should ask ourselves, what three things would you do to yield an amazing year for you professionally? How can you break those down into three doable steps? What space are you clearing in your schedule to perform them? Think about what truly matters to you. Challenge yourself to put a couple things on the schedule for the upcoming week to meet that end. If you can’t do it all, do just a little bit. Vanderkam says that even carving out small chunks of time — say 30 or 45 minutes a day, can make a huge difference. Let’s say your goal is to write a novel. If you committed yourself to just 30 minutes a day (averaging around 350 words per day), in 365 days, you could end up writing 127,750 words. Boom! You have a first draft of a novel. When we say we don’t have time for something, Vanderkam urges us to question whether it’s truly a priority? If yes, Vanderkam says put it on your calendar. If not, to hell with it – make peace with it and move on to other things in your life that are a priority. Vanderkam says challenge yourself to find the equivalent of 30 minutes a day. If you need to break that down into 15-minute increments – totally fine. The idea here is if you can allocate time to those things you love, you’re going to feel amazingly different – a total badass, because you know you’ve devoted yourself to something awesome. Measure where your time actually goes. She encourages us to track our time in an excel spreadsheet – create a time log. There are 24 hours a day, 168 hours in a week. What did you do in the last 24 hours? Write this down. The best way to start spending time better is to figure out where it’s going now. Sorry kids, but there’s no way around this. Time can be measured. If we want to spend our time better, we must figure out precisely where it goes. Vanderkam says to find the data and then make better choices. As you can see, it’s possible to reclaim your time in as little as 30 minutes. Once you regain control of your time, the gift in this is you begin to not only see — through a clear lens — the cost of not doing those things that make you happy or improve the quality of your life but also the vision of joy and excitement that comes along when your time is spent on the right things. Picture yourself a couple of years into the future. If you are fulfilled personally and professionally, what are you doing and who’s with you? Why are you doing those things? Who’s with you? What impact are you having on the world? What makes you excited to do the things you’re doing? What steps can you take to get there? How can you spend more time in your current life on these things? What can you do right now to start making progress on those long term ambitions? Who can hold you accountable to your dreams?